At the dawn of creation, before God made the visible world, but after the creation of the angels, there was a great catastrophe, of which we have knowledge only by its consequences. A group of angels opposed itself to God and fell away from Him, thereby becoming enemies of all that was good and holy. At the head of this rebellion stood Lucifer, whose very name (literally meaning 'light-bearing') indicates that originally he was good. By his own will he changed from his natural state into one which was unnatural; he opposed himself to God and fell away from good into evil. Lucifer, also called the devil (Greek diabolos - 'divider', 'separator', 'slanderer'), belonged to one of the highest ranks in the angelic hierarchy. Together with him other angels also defected, as the Book of Revelation tells us metaphorically: 'And a great star fell from heaven, blazing like a torch... and a third of the stars was struck, so that a third of their light was darkened' (Rev.8:10, 12). Some commentators therefore say that along with the morning star a third of the angels fell away. By exercising their own free will the devil and his demons found themselves in darkness. Every reasonable living creature, whether angel or human being, possesses free will: the right to choose between good and evil. Free will is the property of everyone so that we can, by practicing good, become an ontological part of that good. In other words, goodness was never meant to be granted externally to us but must become our very own possession. If God imposed goodness as a necessity or an inevitability, then no one could ever become a perfectly free person. 'Nobody has ever become good by force', says St Symeon the New Theologian. Through unceasing growth in virtue the angels were meant to ascend to the plenitude of perfection, to the point of utter assimilation to the God of supreme goodness. Yet some of them chose to reject God and thereby sealed their own fate and the fate of the universe, which from that moment onwards became an arena for two contending polar (yet not equal) principles and powers: the Divine and the demonic, God and the devil. The problem of the origin of evil has always been a challenge for Christian theology as it has often had to contend with overt or hidden manifestations of dualism. According to some dualistic sects, the entirety of being is made up of two realms which have forever existed together: the kingdom of light filled with many good aeons (angels), and the kingdom of darkness, filled with evil aeons (demons). Spiritual reality is subject to the god of light, while the god of darkness (Satan) has unlimited dominion over the material world. Matter itself is a sinful and evil entity: the humans should by all means possible mortify their bodies in order to be liberated from matter and return to the non-material world of good. Christian theology viewed the nature and origin of evil differently. Evil is not a primeval essence that is coeternal and equal to God; it is a falling away from good, it is a revolt against good. In this sense it would be wrong to call evil a 'substance', as it does not exist in its own right. As darkness or shadow are not independent beings but are simply the absence or lack of light, so evil is merely the absence of good. 'Evil', writes St Basil the Great, 'is not a living and animated substance, but a condition of the soul which is opposed to virtue and which springs up in the slothful because of their falling away from Good. Do not, therefore, contemplate evil from without; and do not imagine some original nature of wickedness, but let each one recognize himself as the first author of the vice that is in him'. God did not create anything evil: both angels and humans, as well as the material world, are good and beautiful by nature. However, rational creatures, possessing free will, can direct their freedom against God and thereby engender evil. This is precisely what happened: the light-bearing morning star (Lucifer), originally created good, abused his freedom, defaced his own virtuous nature and fell away from the Source of goodness. Without intrinsic substance or being, evil materialized into an active agent of destruction when it was 'hypostasized', that is, when it became a reality in the form of the devil and the demons. Fr Geogres Florovsky speaks of evil as 'nothingness', as 'a pure negation, a privation or a mutilation'. Evil is primarily a lack, an absence of goodness. Compared with the Divine being, the operation of evil is illusory and imagined: the devil has no power where God does not allow him to operate. Yet, as being a slanderer and a liar, the devil uses falsehood as his main weapon: he deceives his victim into believing that within his hands are concentrated great power and authority. The truth is that he does not have this power at all. As Vladimir Lossky emphasizes, in the Lord's Prayer we do not ask God to deliver us from a general evil, but to deliver us from the evil one , from the evil-doer, a concrete person that embodies evil. This 'evil-doer', whose nature was originally good, is the bearer of that deadly non-being, non-life, which leads to his own death and the death of his victim. Most assuredly, God is not a party to evil, yet evil is somehow under His control: it is God Who sets the boundaries in which evil can operate. As the opening of the book of Job shows, there is a certain direct and personal relationship between God and the devil (cf. Job 1-2); the nature of this relationship is, however, unknown to us. According to the mysterious ways of His Providence, and for purposes of edification, God allows evil to act as a means of setting people aright. This is evident from those parts of Scripture where God is recorded as visiting evil upon people: thus God hardened the heart of Pharaoh (Ex.4:21; 7:3; 14:4); God visited Saul with an evil spirit (1 Sam.16:14; 19:9); God gave the people 'statutes that were not good' (Ezek.20:25); God gave the people up to 'impurity', 'dishonourable passions' and a 'base mind' (Rom.1:24-32). In all of these instances it is not God Who is the source of evil: in possessing utter power over both good and evil, God can allow evil to operate in order to transform it into a source of virtue and to direct it towards good consequences. He can also use it to deliver people from a yet greater evil. 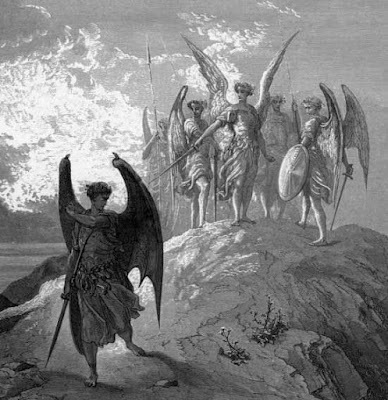 The obvious question still remains: why does God allow evil and the devil to exist? Why does He permit evil? St Augustine confessed that he could not answer this question: 'I am unable to penetrate the depths of this ordinance and I confess that it is beyond my powers', he wrote. St Gregory of Nyssa answered the question in a more optimistic manner: God permits the devil to act for a certain time only, yet there will come a time when evil will be 'finally obliterated by the long cycle of ages' and when 'nothing outside of good will remain, but the confession of Christ's lordship will be unanimous even from the demons'. The belief in the final restoration of the demons and the devil into their initial state was held also by St Isaac of Nineveh, as well as by some other early church writers. However, this opinion has never become a magisterial teaching of the Church. The Church knows that evil is neither co-eternal with God nor equal to Him. That the devil rebelled against God and even became the king and ruler of hell does not mean that his kingdom will last for ever. On the contrary, Christian eschatology, as we shall see later, is profoundly optimistic and strongly holds faith in the final victory of good over evil, God over the devil, Christ over the Antichrist. Yet, what this victory will entail and what the final outcome of the existence of evil will be still remains unclear in Christian teaching. Pondering on this, the human mind once more falls silent in the presence of the mystery, powerless to delve into the depths of Divine destinies. As God says in the book of Isaiah, 'My thoughts are not your thoughts, neither are your ways My ways' (Is.55:8-9 in Septuagint translation).